Donna in the News – Passaic & Patterson, New Jersey. This week Newspapers.Com released two more newspapers that were of interest to my Donna Montran Vaudeville Career work. First, the Passaic Daily Herald had several articles and ads for “Chin Chin” playing at the Lyceum Theatre in Paterson, New Jersey on May 7th and 8th, 1920. Besides the Herald, the News (Paterson, NY) also had advertising and articles regarding that show. This was all new information to me about the venues that “Chin Chin” played at during Donna’s being with the cast. Additionally, the News (Paterson, NY) had a small ad showing that Donna Montran and Her Bathing Beauties played at the Majestic Theater. The date isn’t 100% clear, but it appears that it was January 13, 14, & 15, 1921, that her Beach Promenade played. Both of these are new dates and venues to be added to my list of Donna’s career performances. Jan 13-15, 1921 – Paterson, New Jersey – Majestic Theatre — Donna Montran and her Bathing Beauties. “Donna in the News” is my reporting of newly found newspapers articles and advertising regarding my grandmother, Madonna Montran (aka Donna Montran and aka Donna Darling). I am always excited when I find a new venue for my grandmother’s exciting show business career of the 1910s and 1920s. Author Don TaylorPosted on February 27, 2019 February 27, 2019 Categories Bathing Beauty Revue, Chin Chin, Donna MontranTags New Jersey, PatersonLeave a comment on Donna in the News – Passaic & Patterson, New Jersey. For this week’s Treasure Chest Thursday, I’m looking at a set of clippings from the Donna Darling Collection. First, we see she received top billing of “Great Acts of Vaudeville.” Her show, “Dona [sic] Montran and her Bathing Beauties” included “Eight beautiful California girls from the Golden Gate displaying the coming summer fashions at the beaches; a carload of scenery and a satchel full of costumes. My immediate questions were where and when. This was the first large ad I’ve seen for a theatre where Donna played that didn’t provide the name of the theater. The when was pretty easy. The bill includes the 1920 silent short, “Wedding Blues,” which IMDB indicates was released on November 28, 1920. 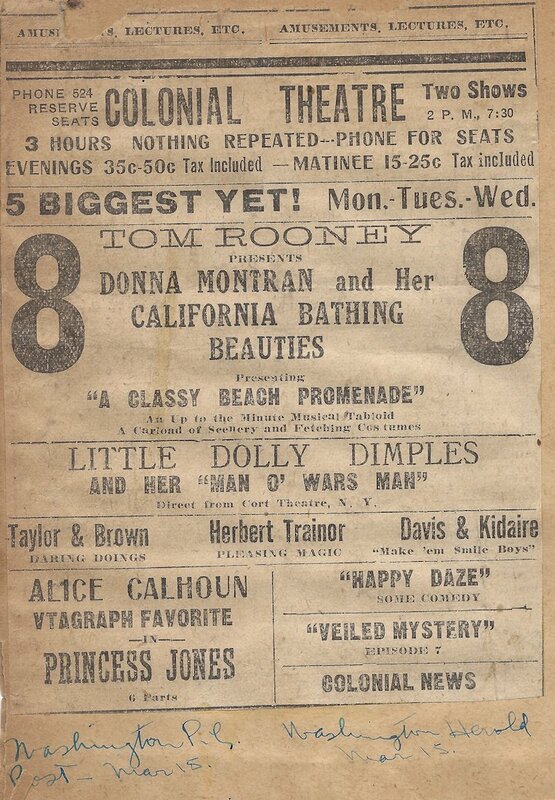 Also, Donna began her “California Bathing Girls” show in July 1920 and it ran until May or June of 1921. A second ad provides information about where. The ad says Donna Montran is coming Monday 8. It isn’t clear what the 8 means, but, if it means date, then it fits that it would mean Monday, November 8th. I’ve seen cases before where IMDB is wrong about the release date, so I’m not too concerned about the inconsistency. Another clipping on the same page provides a bit more insight. It reads, in part, “The act held the stage at the Broadway Theatre, New York for ten consecutive weeks coming direct to Newport from Fay’s in Providence where it established a new record for attendance. The date is possibly 8 November, but more likely December 1920 or January 1921. I have searched all of the on-line newspaper sources I could to determine an exact date for her playing in either Providence or Newport – Ancestry.com, Chronicling America (using Elephind), Genealogy Bank, Google News Archive, Newspaper Archives, Newspapers.com, etc. Search as I may, I was unsuccessful in finding an on-line source for newspapers from that time. The closest I found was the Google News Archive and it has a gap in coverage from Oct 8 thru Nov 15, 1920. Nov 8-10 (Possibly later) – Fay’s Theatre, Providence, RI – Donna Montran and Her Bathing Beauties. According to the Library of Congress, “US Newspaper Directory, 1690-Present” the following Libraries hold the Providence Journal (Providence, R.I.) 1920 issues, typically in microfilm form. I will try to visit the Boston Public Library the next time I am in Boston and see if I can find newspaper article or advertising that proves the dates she played at Fay’s Theater in Providence. Alternately, I’ll add this article to my (lengthly) list of tasks when I can visit Washington DC. Donna Darling Collection – Scan0071. 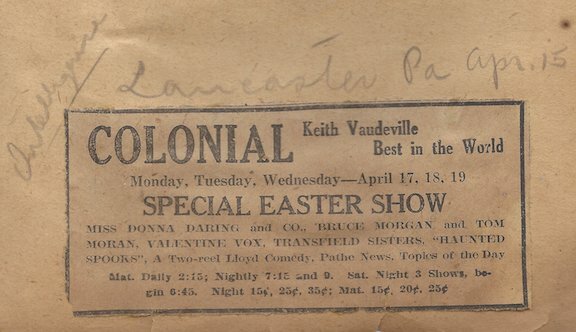 For this week’s Treasure Chest Thursday, I’m looking at several vaudeville clippings from three different pages of the Donna Darling Collection. All of them relate to the Colonial Theater. One to the Colonial Theater in Lancaster, PA. The second one the Colonial Theater in Washington DC, and the third Colonial theater in Detroit, MI. Determining the various locations and dates was challenging but led to new words for my vocabulary and some amazing finds. The first venue was easy to analyze. Donna wrote on the clipping “Lancaster Pa Apr. 15.” It appears that she also wrote “Intelligence.” but I have no idea what that might mean in this context. 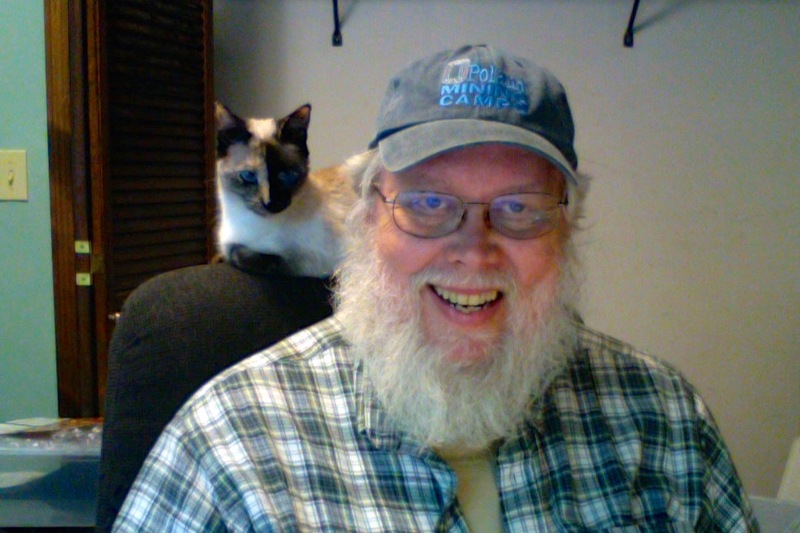 Miss Donna Daring and Co…. 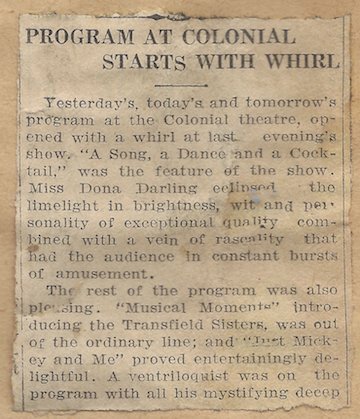 Yesterday’s, today’s and tomorrow’s program at the Colonial Theatre, opened with a whirl at last evening’s show. “A Song, A Dance and a Cocktail,” was the feature of the show. Miss Dona Darling eclipsed the limelight in brightness, wit and personality of exceptional quality combined with a vein of rascality that had the audience in constant bursts of amusement. The rest of the program…. Donna Darling and Company was a show that she had during 1922. A quick check of a 1922 calendar confirmed that April 17th, 18th, and 19th, were Monday, Tuesday, and Wednesday in 1922. Then on Cinema Treasures, I confirmed that there was once a Colonial Theater in Lancaster, PA. It opened before 1914 and later became the Boyd Theater. Besides the newspaper ad there were two short write-ups regarding the show. This was a new date and location for me. Of particular interest is that the newspaper clearly says, “Donna Daring.” This is a new search parameter for me to use in the future. The second clipping was dated March 15th. Donna still went by Montran and she did her California Bathing Beauties in 1921. Monday, Tuesday, and Wednesday of March 1921 were the 14th, 15th, and 16th. Her mentioning it was the Washington papers that the ad ran in, tightens the location to the Colonial Theater in Washington, DC. Colonial – A beautifully stages singing and dancing act in a futuristic version of the nether regions[ii], offered by Donna Darling, former Follies performer, is to headline the vaudeville. Miss Darling and Sammy Clark are both well known stars of terpischore[iii] and are assisted in the act by Barring, Lazure and Hal Dixon. Other acts include…. The Colonial announces a special New Year’s eve show, starting at midnight. This third clipping confused me a bit. I misread the last sentence which says, “The Colonial announces a special New Year’s eve show, starting at midnight.” I misread that it to mean the special show was while Donna was playing there. I searched and searched for a place that had both a Temple Theater and a Colonial Theater. I could only find two places, Chicago and Detroit. Being in Detroit during the holidays made sense as Donna’s mother lived there. I found she played at the Palace Theater in Rockford during Christmas and at the Orpheum in Des Moines in New Years. During my search I used many new search parameters to look for Donna. I ended up finding well over a hundred new dates and venues. It was truly amazing what I found. I have added the new dates and venues to my Donna Montran page. I eventually came to the conclusion that the note regarding a New Year’s Eve show doesn’t apply to Donna’s show. Three new dates and venues directly identified because of Donna’s Colonial Theater clippings. There were also over 100 new dates and performance venues I discovered while doing this research. They have been applied to the Donna Montran Vaudeville Page. Genealogy Bank was used extensively during this research. [i] I have cropped and sized all images for the web – Original scan’s available. 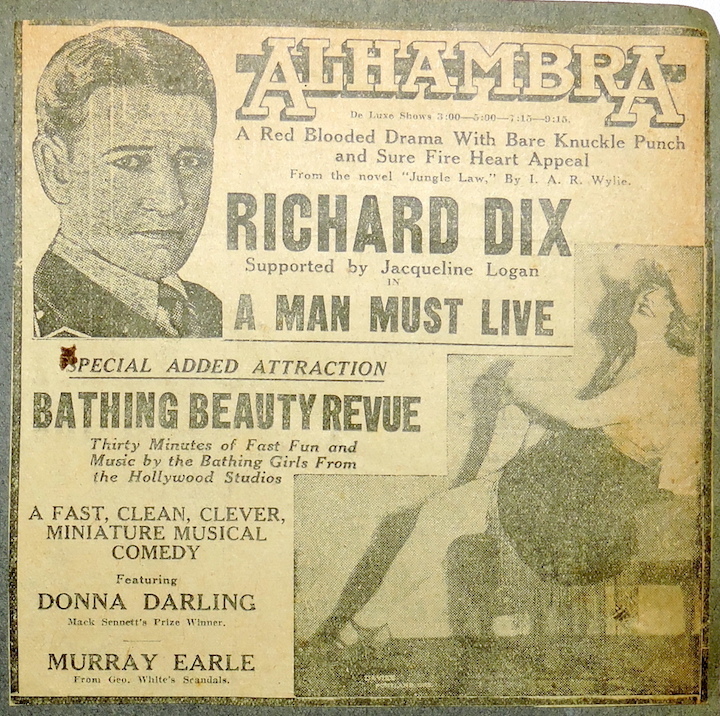 For this week’s Treasure Chest Tuesday, I’m looking at two clippings from the Donna Darling Collection, both dealing with her playing at the Alhambra Theatre. I have cropped, edited, and sized the photos for the web. The venue is the Alhambra. The show is the “Bathing Beauty Revue” featuring Donna Darling and Murray Earle. A further search of the Milwaukee Journal found an advertisement of the Milwaukee Alhambra Theatre using the very distinctive logo which was used in the advertisements that Donna had in her collection. (Larger first and last A’s in the logo.) 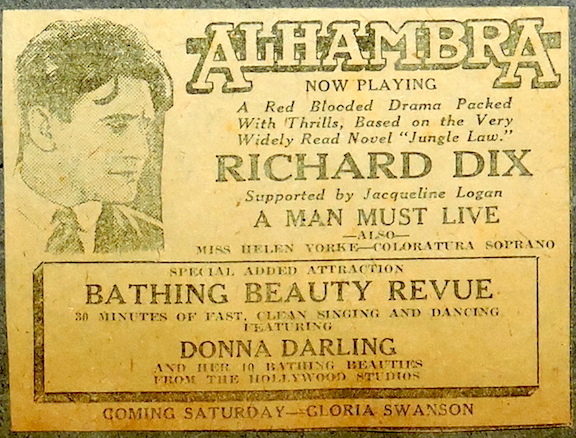 The January 21st was a Wednesday and Donna’s scrapbook ad indicates that Gloria Swanson was coming on Saturday, so I believe she probably played at Alhambra 21, Wednesday, Thursday, and Friday (January 12, 22, and 23, 1925. January 21-23, 1925 – The Bathing Beauty Revue featuring Donna Darling (Mack Sennett’s Prize Winner) and Murray Earle (From Geo. White’s Scandals) as well as “her 10 bathing beauties from the Hollywood Studios” played at the Alhambra Theatre in Milwaukee, Wisconsin. Standard: Research the Milwaukee Alhambra Theatre and write about Donna’s show there. [i] Cinema Treasures – Search for theaters named Alhambra http://cinematreasures.org/theaters/united-states?q=Alhambra&status=all NOTE: There is a problem with the search function on Cinema Treasures. When searching “All Theaters” it only searches Open and Closed theaters. It does not include “Demolished” which must be searched separately. [iii] The Milwaukee Journal (Milwaukee, WI) 21 Jan 1925, Page 13, Column 6, A Man Must Live – Via Genealogy Bank.